Shake Things Up and Do Things Backwards with Omni Slots This Thursday! The end of January seems to have creeped up on us without us even realizing it. If you’re feeling a little bit disconcerted about the speed of this month, we’ve found a great promotion to help you put things into perspective. Omni Slots Casino is going with the flow of everything upside down and inside out and will help you end off the month with a bonus bang (and some free slots thrown in for good measure). Log into your Omni Casino account on Thursday, January 31st and take a break from the run by doing everything backwards. Omni Casino has declared the last day of the month National Backwards Day. To celebrate, all you have to do is do everything backwards! It’s as simple as that. "Your 25% sunoB and 20 snipS eerF! Are you ready to mix things up?"" asks the online casino. "Play now at Omni Casino Slots! Today is the day the world gets turned upside down and inside out and madness becomes sanity and day becomes night, at least in concept. There's just too much seriousness in the air, and sometimes you really just have to bend all the rules, mix things up and do things your way!" January 31st honors absolutely everything and upside down at Omni Slots Casino. The site encourages you to get in the spirit of things by wearing your outfit backwards, talking and writing backwards, or even eating your dessert for breakfast. To make the day even quirkier and more fun, the online casino is giving you a special Backwards Bonus and 20 free spins on a cool slot game. Log into your real money account at Omni Slots Casino. Make a deposit of $30 or more on Thursday, January 31st. Choose the Backwards Bonus in the second step and you will receive a generous 25% match bonus of up to $200! If you made a deposit of $30 or more on January 31st at Omni Slots Casino, you will be able to claim 20 free spins on the fun slot game, Madder Scientist. What better slot game to help usher in the craziest day of the year?! You will only be eligible to claim the 20 free spins on Madder Scientist slot if you make a deposit of $30 or more on Thursday, January 31st. The minimum deposit required to receive the 25% Backwards Bonus reward is $30. The 25% match bonus only applies to the first deposit of the day which you make on Thursday, January 31st. The maximum payout you will get from winnings on the free spins is $250. The maximum bonus value is $200. 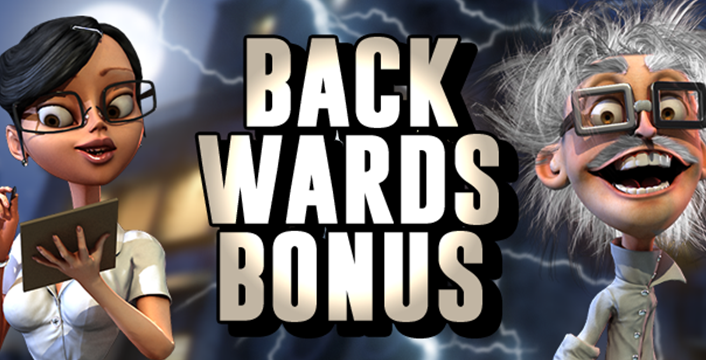 Unfortunately, you may not use the Backwards Bonus in conjunction with other bonuses at the site. Other wagering conditions may apply to this offer. Remember Betsoft Gaming’s Mad Scientist slot game that boasted zany characters and crazy rewards? Now you get to enjoy the sequel of this game in the form of Madder Scientist slot by the same innovative software giant. The game is absolutely filled to the brim with bonus features and is a joy to play. 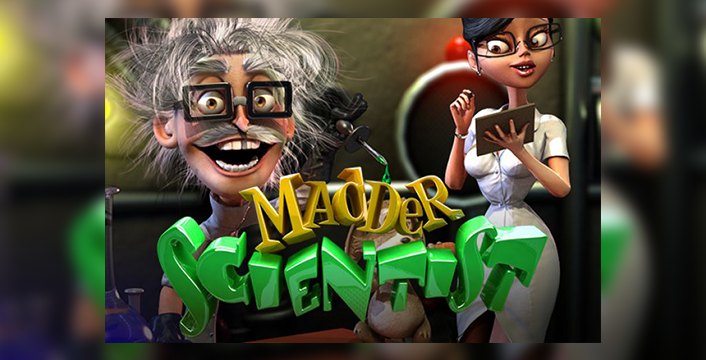 At this point it is important to note that Betsoft Gaming has made sure that Madder Scientist slot is fully compatible with most mobile devices and it looks amazing on iPads and tablets. Remember, Betsoft Gaming is king of 3D slots entertainment, and this also applies to mobile online casino gambling. The main feature in Madder Scientist slot is its reel re-spin feature which allows you to re-spin any of the five spins after any spin! Of course, this feature comes with a price, but you will soon agree that it is simply too tempting to say no to it, and it may just be your lucky break needed to win the jackpot. Madder Scientist slot also boasts two Pick Me Bonus features and they both put you in line to win up to 30 times your wager. You will have a great time playing on this five reel, 30 pay line slot game; not only because of the clever animations and zany theme, but also because you have a good chance of walking away with rewards at the end of your game session.